In late 2014 the sixth volume of the James Stuart Archive of Recorded Oral Evidence Relating to the History of the Zulu and Neighbouring Peoples (edited by the late C.de B.Webb and J.B. Wright) was published by the University of KwaZulu-Natal Press, bringing the number of pages of edited, translated and annotated archival text to a total of 1697 (excluding indexes), organised alphabetically from Antel to Zwayi, under the names of 185 primary interviewees. The conference celebrates this remarkable editorial achievement and its contribution to the enquiry into the southern African past in the many eras before the advent of European colonialism. It also foregrounds and seeks to take forward new developments and thinking about these eras. It does this through a double focus on the different forms of archive relevant to the various eras and on the innovations – conceptual, theoretical, methodological, technological, practical or creative – involved both in mobilizing such archives, and indeed other materials considered to be not-archive, and in pursuing enquiries into those eras. innovations- conceptual, theoretical, methodological, technological, practical and creative – in enquiry into these eras. The James Stuart Archive is a rare southern African treasure for a number of reasons, of which two are particularly significant. The first is that while the collection is undoubtedly the work of the collector, and has been fundamentally shaped by him in ways that are the subject of ongoing critical scholarly investigation, the recorded texts also offer insight into the thinking of the various people whose accounts Stuart recorded. The bulk of the material was documented between 1897 and 1922, when Stuart interviewed some 200 people whom he considered to be well informed on contemporary and historical matters relevant to the region. He took detailed notes in the course of the conversations, often seemingly recording people in their own words. His working methods, the contributions of his interlocutors and all the other factors that shaped the archival texts, are the subject of ongoing scholarly attention. 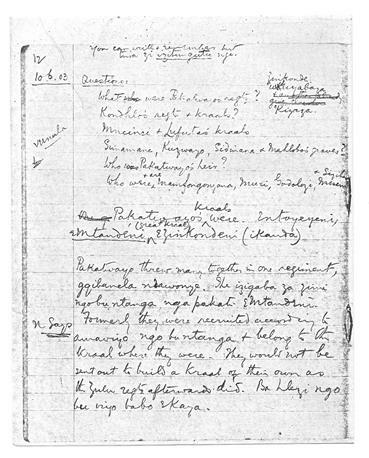 The combination of the extensiveness of the corpus and the nature of the material covered by interviewer and interviewees, often dealing with topics little discussed elsewhere in written documentation of the time, makes it one of South Africa’s most valuable historical resources pertinent to the late independent era in south-east Africa, as well as the colonial period that followed. The past decade has seen the paying of close attention to the making and shaping of archive in many forms, while archive/s have also been the subject of sustained theoretical and methodological discussion. Long understood to be a time without an archive, the eras of the past before European colonialism and enquiries into them both draw from and contribute to, in distinctive ways, the larger critical discussion about archive, itself otherwise decisively shaped by European intellectual history. The conference theme on the nature and forms of archive focuses attention on these distinctive ways, seeking to understand what they mean for the wider understanding of archive and what they mean for enquiries into the long southern African past. We welcome papers not only on similarly iconic text-based archives (like the much celebrated Bleek and Lloyd Archive of material collected from /xam and !kung speakers between 1870 and 1884) but also on lesser known text-based sources, including ones which might heretofore have never been explicitly treated as archives. The conference hopes to interrogate taken-for-granted distinctions between primary and secondary sources. When, for example, is a published account be considered an archive, and of what precisely is it an archive? We are interested in discursive materials that may not take a written form, including poetic forms, songs and invocations, and in interrogating critically the notion of “oral tradition”, seeking not only its disaggregation, but also careful reassessment of the conceptual apparatus associated with it. We are especially interested in the nature of materials that are relevant to the remote past which have been or are yet thought of explicitly as “not archival”. Items of material and visual culture are widely used as sources for various aspects of enquiry into the past, but often in a manner that assumes that they have a timeless cultural relevance. We invite papers that build on recent work which historicises such items, paying close attention to particularities of provenance, circumstances and effects of collection, classification and curation. Current work is beginning to recognize incorporated, as opposed to inscribed, archival forms, notably embodied forms of materials that refer to the past. We invite contributions that grapple with the complex challenges involved in exploring, for example, contemporary instances of spirit possession and rituals concerning ancestors, for what they might add to an understanding of the distant past. How do we think of what has been termed the pre-colonial beyond the strictures of prepositional time? The academic orthodoxy teaches us to approach it as the distant past, as an evacuated experience, as a domain of specialists. And yet, our everyday scenes are stamped by its uncanny fecundity, its untheorised proximity, its entangled lives in the contemporary. In a variety of different ways – imaginatively, expansively, subjectively, critically, affectively – contemporary artists, writers, family and clan historians, politicians and intellectuals engage the body of inherited materials that academics and lawyers use as “sources”, often with very different purposes, from the celebratory through the denunciatory to the parodic. All of these engagements with the eras of the past before European colonialism, and with the ways in which the colonial and apartheid eras dealt with the earlier periods, undertaken by historians and many others, contribute to contemporary understandings and meanings of the distant past and fall within the purview of the conference. In the nineteenth century, many colonial intellectuals took the history of the region before colonialism seriously enough to record and collect materials pertinent to it and to write its histories. In the post-conquest context of the twentieth century, the many eras of the long past, and indeed the history of indigenous people in the colonial and apartheid eras, were systematically ghetto-ised as the subject of the disciplines of archaeology, anthropology, linguistics and prehistory, and as requiring a specialist conceptual apparatus pertinent to the study of ‘tribal’ or ‘pre-modern’ societies. Unpacking the legacies of this conceptual apparatus requires comparative perspectives from across and beyond the continent attentive to the cross-genealogies of the tribal and the modern. These concepts have lingering effects that are yet discernible. In trying to think about the past beyond the warranty of these concepts, we also invite reflections on the ways of being in the world in which that past may not necessarily be an object of capture. Our conference, therefore, is inevitably an engagement with the new. As it seeks to break out of the academic ghetto-isation, its exploratory restlessness challenges the established boundaries of disciplines, regions and identities. What happens when we consider enquiries into the past before European colonialism in the light of the contemporary insights on religion and affect, fashion and beauty, embodied knowledges, decoloniality, performance theory, border epistemologies, theory from the south, and so on? The conference rationale is founded in a long view of history, seeking to subvert persistent habits of treating the past before colonialism as another country, and the advent of colonialism as the history of the region’s starting point with only a passing nod to, or introductory paragraph on, what went before. What happens when histories of ideas, modes of thought, institutions and practices, and the changes which they have undergone, are traced across the early state, late independent, early colonial, apartheid, and even post-apartheid, eras? In the conference even the latter, provisional, periodization would itself be open to debate and question. For more information, please email APC-admin@uct.ac.za. This entry was posted in history, memory, politics, writing and tagged affect, apc, archive, archive and public culture research initiative, colonialism, coloniality, conference, decolonisation, oral history, university of cape town. Bookmark the permalink.